Both of these facets make OkCupid not just a fantastic dating service, but a tool for learning more about people and also for collecting marketing insights. Honestly, try doing the activities in this article on Tinder, it won’t get you anywhere. We recommend you create a fake account for doing this. While doubtless this is against Okcupid’s terms and conditions, it saves people from thinking that you are creepy by looking at their profile. Create that and then answer some of the quiz questions (the more the better) so that OkCupid can more accurately compare you to other people (more on this in a sec). For all these activities, we’re going to be going into Browse Matches and then Filters. 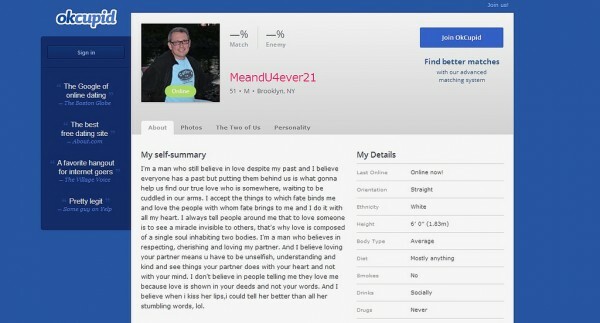 This is the main way that you find people on OkCupid—it’s a search interface like Google, but the pages you are searching for are people’s profiles, and you can filter them by a variety of attributes and also sort them. The default Sort algorithm for the results is Special Blend—which is a trade-secret like McDonald’s Special Sauce. So you will benefit from using other Sort algorithms as well. The filter algorithms you should start off with are: both genders, an age range 5 years around your own and a location of Near Me or at least wide enough so there are lots of matches, but not so wide that they are from totally different places (this is possible unless you live in the outback). In this first activity, you’re going to learn more about people your age—from both genders—irrespective of whether you find them attractive even though you will doubtless click on more attractive people but it doesn’t matter. Go to the Filters and adjust the age range to be 5 years around your own. Select both genders. And that’s it for the filters. Now it’s time to look at some profiles. Under Special Blend sorting you will be surprised at the accuracy. If you have completed enough quiz questions the people at the top will be surprisingly similar to you. You might make some friends. And my hypothesis is that Special Blend doesn’t just include people who you are like, but people who you will like. In all these search categories, take note of what people your age are doing. Are most of them studying? Do they have good jobs? Are they successful? Are they articulate? This kind of thing grounds you in the real situation, and it can tell you what are your strong points and what you should improve on. Then try sorting by Match % for a more pure algorithm that shows you people that are just similar to you. This one is a real eye-opener, because you may make not just friends, but a few enemies. Seeing people that are similar to you often creates these strong, complex feelings of like actual hatred and disgust. You dislike these people because they are similar to you but are doing just a few minor things ‘wrong’ and seem really mislead. Or they remind you of the way you were in the past which you feel self-conscious about and hence you project this onto these people. Or, the worst is when this person seems like a better version of you and they are good at all the things that you are good at and you value and you feel bad for even hating them because you are hating an idealised version of yourself. All this will happen, and you will realise that OkCupid is a very emotional website. But now for the really interesting part, set Sort to Enemy %. These are the people who are least like you and some of them will infuriate you by personifying everything that you are not. My greatest enemy used to be this guy that likes to take things apart and put them back together again because he can’t think of anything to work on, and always wants ideas for things to program. There’s nothing wrong with this and I’m glad people like this exist to make software and engineering feats and most of the important things in the world but it made me realise why OkCupid calls these people your ‘Enemies’. Emotions aside, you can learn more about what you are like by learning about people who aren’t like you, and you can learn about people who are completely removed from your social circle. This really is one of the rare un-hyperbolic examples of becoming ‘worldly’. By varying the Age filter you can see profiles of people from other ages, and it’s fascinating because you get a view into what life is like and what you may be like when you are that age, and of what the younger generation is like. This kind of insight was prior to the advent of the internet, hard to obtain because people tend to form groups based largely on their age group. If you are young, the profiles of older people may give you a sense of realism. If you are old, the profiles of younger people might give you access to the current culture that was in previous eras, inaccessible to the middle-aged. By playing around with the Location filter you can find people all over the world. It won’t open your eyes to the ways that people in less fortunate countries actually live for several quite obvious reasons, but it will give you insight into what they are like. My favourite was people from Taiwan who have the highest Match % to me. There are some very cool cats in Taiwan and I got some Chinese punk rock from it which was unexpected. And you can see that the combinations of filters quickly become astronomical—which is why it is easy to lose yourself in this thing. I like doing that sometimes. 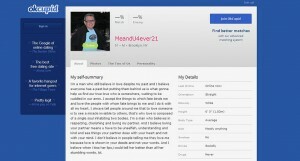 But the greatest potential of OkCupid is for use in marketing research. It is basically a search engine that can be filtered based on demographic and which contains profiles on how each person describes themselves and what they like and dislike. What a goldmine! If you are in marketing, I would make an OkCupid account and make it one of the primary, go-to databases for use in your organisation. It’s comprehensive and personal and up-to-date and absolutely free.